Place the chocolate, cream and cinnamon in a saucepan over low heat and stir until melted and smooth. Pour into a lightly buttered 1 liter-capacity dish and set aside to cool to room temperature. Cover with plastic wrap and refrigerate for 4 hours or until firm enough to roll. Roll teaspoonfuls of the mixture into rough balls. Press a hazelnut into the middle and roll to enclose. Place the cocoa on a baking tray, place the truffles on the tray and gently shake to coat. * place the hazelnuts on a baking tray and roast in a preheated 180°C/350°F oven for 5 minutes or until lightly golden. Place the hot hazelnuts in the fold of a tea towel and rub back and forth to remove the skins. Wow, these look decadent! 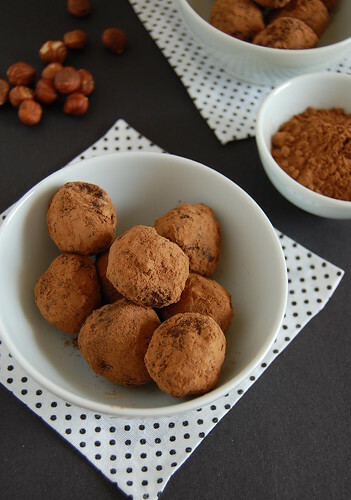 I've been wanting to make some truffles for a while now and this recipe looks simply divine! These look lovely Patricia. Be good to have some extra sweets around the holidays. Boy, do I wish I lived close by you. I could be your bff (Ilike shoes)! Ohmegod!!!!! Bradshaw is soooo my number, as much as these truffles...you are the sweetest and I luv u very much :) thanks for being so close. It's amazing how so few an amount of ingredients can produce such lovely and rich results! 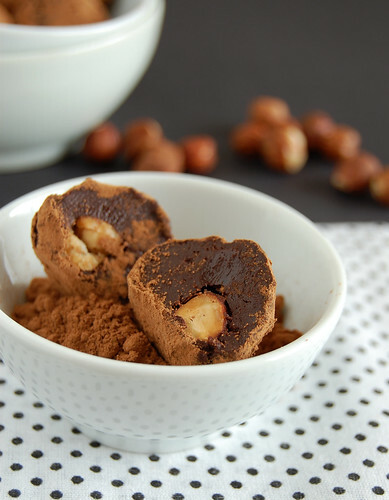 I love the contrast in texture that you have here by inserting a hazelnut in the middle--What a great recipe! My goodness they look so decadent - I have a bad feeling that if I made these I would eat them all! Rachael, thank you! I hope you give these a go! Pam, I would love to have you as my neighbor, my dear. C., my dear, thank you, too! Valerina, you are so right! Alexa, thank you! I think the hazelnuts add both flavor and texture here. Valérie, thank you, darling! I hope your loved ones like the truffles! I need to do some 5 varieties of truffles and this is noted! i really enjoy your blog, great job!